A bit over the top but we might as well look at what the big boys do. You have a unique fashion vision, your niche. 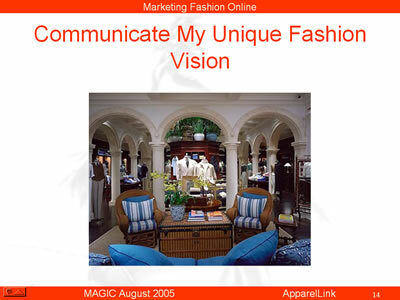 The retail store you build and your merchandise mix reflect that vision. 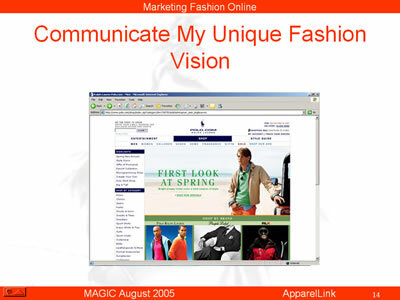 It is no different with your eCommerce web site. When a potential customer walks past your store you draw them in with your window display. Your customer sees your window because you are paying rent for a location where your customer shops but location only guarantees that the customer will see your window. It is your job to entice them to come in. Your success depends on how the customer then relates to your merchandise. Delivering traffic to your web site is only the first step. Your home page serves the same purpose as your store’s display window. We cannot stress strongly enough that attractive content is the single most important factor in drawing visitors into your site.